can be verified by ultrasonic scans. The efficacy of Equine Cold Spa Hydrotherapy can be verified by using ultrasound scanning. Harry, a thoroughbred racehorse, was rescued from the slaughterman having sustained a very bad tendon injury due to a fall in a race early this spring. Following his injury Harry was given box rest for five weeks prior to being brought to the Centre of Equine Therapy in Dromore, Co. Down on the 10th April. His rehabilitation has been filmed by the BBC and was broadcasted in the beginning of August. 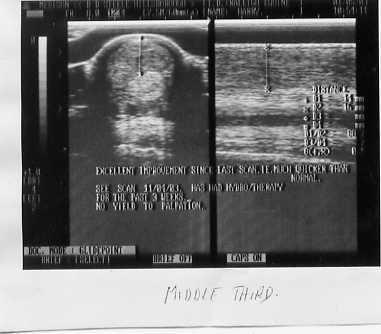 The first scan, on the left below showing longitudinal and cross sectional views, was taken on 11th April 2003 prior to commencement of Equine Spa Hydrotherapy treatment and despite 5 weeks of box rest the tendon is still showing over 90% damaged tissue i.e. virtually anechoic. The scan on the right was taken on 1st May 2003 following 20 days of treatment. The two smaller pictures underneath are expanded sections of the same scans. Below is the expanded longitudinal view of the same foreleg. The two "x's" show the superficial digital flexor (SDF) or tendon which is just below the skin. The SDF is black in colour showing over 90% tendon damage. The right hand "+" is located just on the inside of the layer of skin i.e. there is a gap of approximately 2ml between the skin and the tendon which is filled with peri-tendinous fluid. Under normal circumstances this horse would probably not race again. The picture above shows the same leg after just 20 days of hydrotherapy treatment. 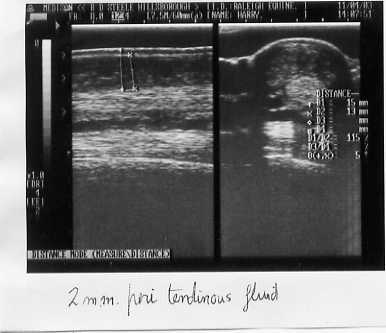 The peri-tendinous fluid has dissipated and the tendon is showing good parallel alignment of healthy tissue i.e. much whiter in appearance. This horse could race again subject to continued treatment combined with a slow and steady re-introduction to training. The scans were taken by leading Northern Ireland Equine Vet, Bruce Steele, of the Equine Veterinary Clinic in Hillsborough.